Triumphant return of Australian trio The Lucksmiths with an exceptional new EP and the band's first release since 'A Little Distraction' in 2003. 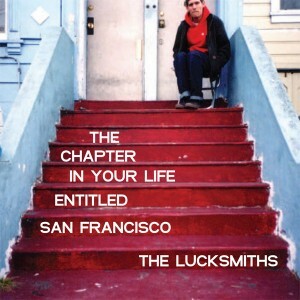 Lead track 'The Chapter In Your Life Entitled San Francisco' is taken from the forthcoming album 'Warmer Corners' scheduled for April release and is one of those summery Lucksmiths pop hits with clever lyrics, tambourines, organ and strings. The EP also features three non-album tracks exclusive to this release - 'Young And Dumb' is a lighthearted tune with a great chorus, 'The Winter Proper' a melancholy piano rich song that captures the season perfectly, and 'I Started A Joke' a brilliantly understated cover of the adored Bee Gees' classic. Limited to 1000 copies in custom minijacket sleeve. Watch for US dates in support of the single and album in April and May.